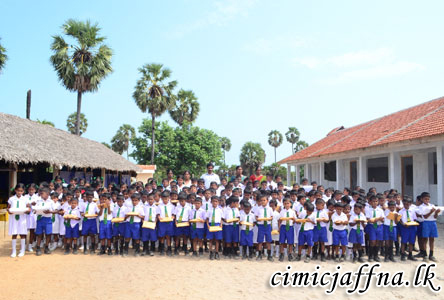 A group of students who got through Grade 5 scholarship 2014 examination from Vadamaratchi Education Zone received school items and uniform as a donation with coordination of 553 Brigade on February 6th at J / Uduthurai Hindu Primary school, Thalayady. The donation, sponsored by Mr. Ivor Vancuylenberg, Vice President Kinder Haifer, Fulda, Germany and arranged by 10th Vijayabahu Infantry Regiment (10 VIR) were distributed among 190 students. Value of items distributed is of about Rs. 150,000/=. 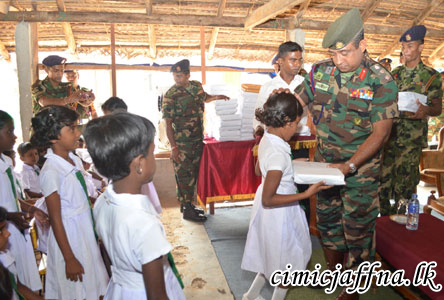 Commander 553 Brigade Colonel Vijith Subhasinghe, Commanding Officer 10 VIR Lieutenant Colonel Upul Satharasinghe and principal of the J / Uduthurai Hindu Primary school Mr. S. Iyanthiram were also present.